Equipment: Stormguard wears two wrist mounted golden gauntlets capable of generating energy constructed shield and blade. It also has a teleportation button allowing him instant access to the Justice Satellite. His also wears body armor to enhance his resistance to injury. Stormguard is a war time veteran but everything else in his past is a mystery [Future’s End #16]. He first appears as a member of the Justice League during the Future’s end storyline after Green Arrow’s death [Future’s End #2]. He was also present for the dissolution of the Firestorm due of Jason Rusch and Ronnie Raymond [Future’s End #11]. When Rampage almost killed a disguised Billy Batson, Stormguard was the one who saved his life [Future’s End #18]. He later aided the Justice League when they battled Martian Manhunter on Mars [Justice League Future’s end #1, Justice League United Future’s end #1]. agree, not feelin it either. Although, I agree with the stars and stripes comment, Stormgaurd has a lot of potential to be explored. 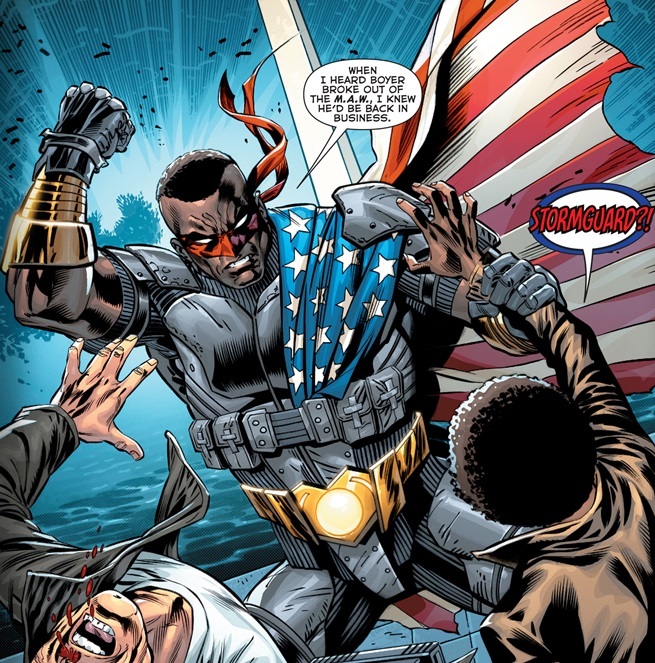 Jon Stewart was another military vet that became a very powerful in the DCU, Val-Zod os another hero that needs more exploration and deeper exposition. I feel that black characters get a summary of an exposition and used as back up or plot pushers. Bring back the days of Milestone comics, and we as a whole need to create more ethnic or cultural heroes, rather than, the stereotypical.